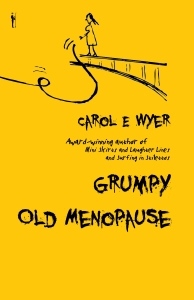 Today we have a sneak peek from the humorous self-help book by Carol Wyer: Grumpy Old Menopause. Have you started to write post-it notes with your kids’ names on them? Do you need to change your underwear after every sneeze? Guess it’s time to read this book then. It’ll help you get through “that” time in your life with a spring in your step and a smile on your face. With numerous suggestions, sensible advice and amusing anecdotes, Grumpy Old Menopause will help you sail through that tricky part of a woman’s life with ease and humour. It should prevent you from turning into Mrs Crabby or worse still, a demonic monster. Grumpy Old Menopause is available through Amazon.com, Smashwords, and Amazon UK. Cairo Caper, Barbara Silkstone’s mysterious comedy, is available through Amazon.com and Amazon UK. Don’t forget, you can cast your vote for trailer of the month on December 28, 2013 at 5 p.m. Pacific time. Oh, for heaven’s sake, let me try again…m-n-e-m-o-n-i-c-s. There, but please don’t ask me to say it again!